Yesterday was my first attendance at the Tuttle Club which I've been wanting to go to for months but haven't managed til now. The morning exceeded all my expectations and I had some great conversations catching up with old friends, meeting some of my online contacts in meatspace for the first time and making some totally new connections. Another first timer I met was Iain Dodsworth, the founder and sole developer of TweetDeck, which is my favourite application for Twitter and runs on Adobe Air. 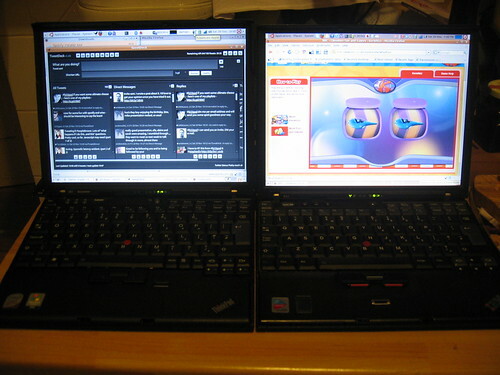 I have been using TweetDeck on my ThinkPad x61 running Ubuntu Hardy 32bit for the last few months and I'm a big fan. Considering that TweetDeck is in some aspects my universe at the moment, you could view it's creator as my god. When asked by Documentally about his plans Iain explained about TweetDeck Pro. He is developing this to work with a whole host of services. This got me excited, only a few days prior at the NetSquared tuesday meetup I was professing my desire for such a tool, not knowing that someone was already on the case and definitely not expecting to actually meet them a few days later. For more on what Iain is up to check out Documentally's excellent interview with Iain. As I explained to Iain I had not been able to get TweetDeck working on my 64bit workstation (this is a problem with Air on 64bit rather than TweetDeck) this has been a bit of an issue, having to have my laptop open on my desk as well as the two existing screens attached to my main workstation. I tried and gave up trying numerous workarounds suggested for the 1.1 beta version of Air. When Air 1.5 was released I tried it straight away in the hope the issues had been solved. This was not the case and the experience was no different from Air 1.1 - Air installs fine and so does TweetDeck but when I open TweetDeck I get the outer window with the top toolbar but nothing else, no columns and no request screen to logon with my Twitter credentials. Not wanting to be beat this time, I followed these steps www.kozaru.net/2008/08/12/adobeair-alpha-on-ubuntu-64-bit/ to get it working using the Air SDK. This produced exactly the same result as the normal install. However, as I was running the initiation script from a terminal, I could see the error reports where it fell down. and hey presto simlink is fixed. On running my shell script to start the SDK TweetDeck workaround it pops up asking for Twitter logon details and in I go, perfect. Finally I wonder if maybe this was all that was wrong with the standard install, so I run that and indeed it too now works perfectly. I've been all round the houses and didn't need the more complicated SDK setup after all - nevermind it's good practice for me anyway.